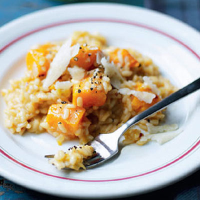 Use beautiful autumnal squash in this vegeterian risotto. Preheat the oven to 200°C, gas mark 6. Toss the frozen squash with the chilli, cumin and 1 tbsp oil, then season and roast for 30 minutes until golden. Heat the remaining oil in a medium pan. Stir in the onion and celery. Cook on a low heat for 8 minutes. Add the rice and cook, stirring, for 1 minute. Add the wine, simmer while stirring, until absorbed. Now add the stock, a ladleful at a time; stir often and ensure each is absorbed before adding the next. When only a ladleful or two is left, stir in half the squash. Continue adding stock until the rice is al dente. Stir in the butter and most of the parmigiano reggiano. Serve on warmed plates topped with the remaining squash and cheese.